Smooth, oil and fuel resistant Nitrile rubber (NBR). Wire cord, synthetic textile fabrics and embedded steel wire helix. According to EN 1765 Flexible hose for suction and discharge of mineral oils and fuels with an aromatic content not exceeding 55%. PELAGO hoses, with their exceptionally strong structures and technical characteristics, are suitable for high capacity pipelines and can solve any problem connected with the filling and emptying of tankers at wharves or off-shore installations under particularly heavy duty conditions. cover in CR, wire cords reinforcement and steel wire helix. According to EN 13482 BITUME hoses with their flexible, exceptionally strong structures and technical characteristics, are designed for solving operational and safety problems connected with the conveying of hot asphalt and bitumen in dock side, road and rail loading and unloading installations. Working temperature: -10°C (-40°F) to +180°C (+356°F). Viton lining (FKM) resistant to 100% aromatic content. Wire cords and steel helix reinforced. According to EN 1765 Flexible hose for conveying highly aggressive chemicals. Synthetic textile fabrics and emdedded steel wire helix. BAIA hoses with their strong structures and technical characteristics, are suitable for MEDIUM DUTY operations for emptying and filling tank-trucks, storage tanks on wharves in on-shore installations. Working temperature: -20°C (-4°C) to +82°C (180°F). Golfo hose type has been replaced by Seaflex STS hose. Heavy duty design – Safety factory of pressure strength is more than five times of the operating pressure. No permanent deformation – Helix wire free construction – Deformation shall not remain permanently even though hoses get kink by rough bending and deformation by slight vacuum during operation. We are pleased to announce that also YI-IT has successfully certified the Yokohama STS full range. Please see below official Certificate release. The World’s Leading producer of Refrigerated LPG Hoses. 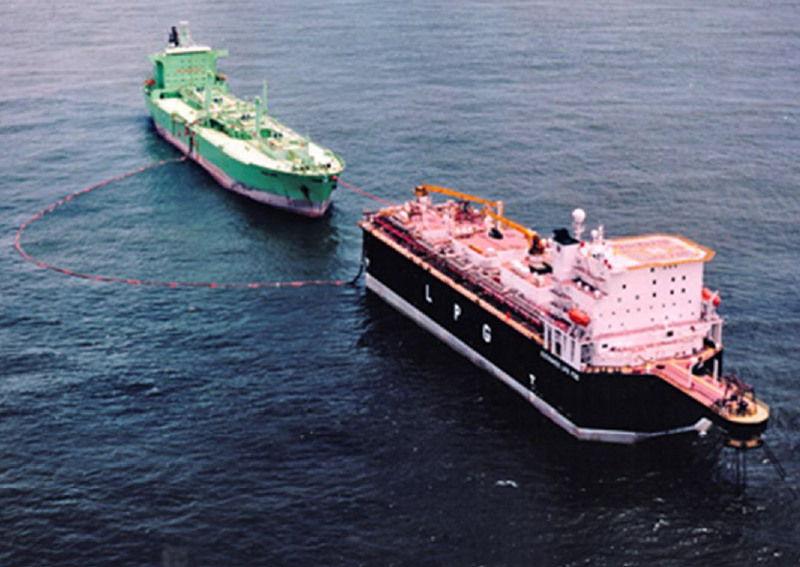 A 2 year joint venture with Chevron resulted in the first ever tandem mooring offloading floating hose for the transfer of refrigerated LPG at -50°C (Escravos project).